There is something about sunsets, and clouds. Here in Illinois, we can’t add mountains or oceans to the scene. We can add buildings and wires and poles, however. Most photos on Facebook of gorgeous sunsets around here are cluttered by buildings, cars, light poles and wires blocking the rays of sun that our eyes find so alluring. Our minds seem to filter out those distractions, but the camera is not so kind. As I looked upon the gorgeous painting God was making in the Illinois sky last night, all I saw were the buildings and cars in the way. I was actually in the grocery store parking lot at the time, since daylight savings time had just ended and 4:30 meant it was now sunset for November. So I looked higher up, at the clouds themselves. 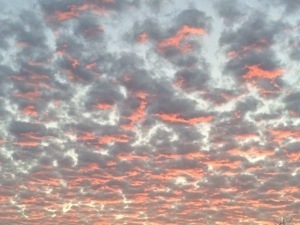 I saw the puffy clouds, almost blue in the dusk sky, with the tinges of pink from the setting sun. Gorgeous! Without the rays of the setting sun, or the horizon that would give you placement, this image gives you out the chance to just see the play of light on the clouds. Of course, what I had was my iPhone, so this is was captured using the HDR option on the iPhone 5s camera.